This is an excerpt from my new book Nothing Changes Until You Do, posted with permission. Published by Hay House and available online or in bookstores. I was in the bathroom one morning a number of years ago getting ready for my day. As I was shaving and taking care of my morning routine, my gremlin was actively and negatively commenting about a number of specific things related to my appearance. That nasty and critical voice in my head said, Look at you, you look awful! Your hair is thinning, you're gaining weight, you have dark circles under your eyes, and those worry lines on your forehead keep getting deeper. You're clearly not taking good care of yourself. I was doing my best to ignore my gremlin, finish up in the bathroom, and get on with my day. As I was in the midst of this process, there was a series of loud bangs on the door--boom, boom, boom! "Daddy!" said my then two-year-old Samantha. "Daddy, Daddy, Daddy--open up!" Samantha, who has always been quite passionate, was going through a phase where she was barging into rooms, particularly the bathroom, all the time--so I'd been well trained to lock the door whenever I went in there. "In a minute, honey. Daddy's shaving," I said. Samantha continued to bang on the door and said, "Daddy, open the door! I have to tell you something important." "I'll be out in a minute, sweetheart," I said, hoping she would just go away (although I knew there was little to no chance that would actually happen). "Daddy," said Samantha, "it's really important." I let out a big sigh, and with a towel wrapped around my waist, shaving cream on half my face, and a pretty bad attitude, I begrudgingly opened the door. "Yes, honey, what is it?" I asked, impatiently. I looked down and saw Samantha standing there completely naked with a huge grin on her face. She looked up at me, spun around with a little twirl, and, with her arms outstretched, said, "Daddy, look how cute I am!" Then, quite pleased with herself, she gave me a big hug and ran off. The irony of the situation was not lost on me. Although I wasn't sure if I should laugh or cry, it hit me in a profound way that Samantha's relationship to her own body and appearance was quite different and more empowering than mine. Being hypercritical of my appearance, unfortunately, is a somewhat common experience for me and is something that I've struggled with significantly at times in my life. Some of the deepest pain and self-loathing I've ever felt has had to do with my feeling ugly and not good enough physically. I'm sure there are a variety of external factors that have contributed to this to some degree--growing up with parents who didn't feel good about themselves physically and who both talked about that quite a bit; being focused so intensely on the shape, size, and function of my physical body as a competitive athlete for almost 18 of my first 25 years on the planet; and being impacted by our media and culture, which seem to have an insatiable obsession with appearance, beauty, and body perfection. However, at the root of these issues for me (which I think is true for most of us who struggle with this) is a deep sense of feeling fundamentally flawed. A couple of things have added to the complexity and confusion of this particular issue for me over the years. First is that I've gotten mostly positive feedback about my appearance. I've never really been significantly overweight. Nothing is physically "wrong" with me, but I still feel unattractive. Which leads to the second bit of added confusion: I'm a man. Body image stuff, as we often read about, is portrayed mostly as a "women's issue." However, it has been a major issue in my life. At times I'm not sure what's worse, feeling bad about my body and appearance, or feeling embarrassed that I feel bad about my body and appearance--both of these experiences have produced feelings of shame, guilt, sadness, anger, and conflict within me. And I know I'm not alone. This isn't something that only affects teens, celebrities, or women--it's something that people of all ages, body types, races, genders, backgrounds, and professions struggle with. 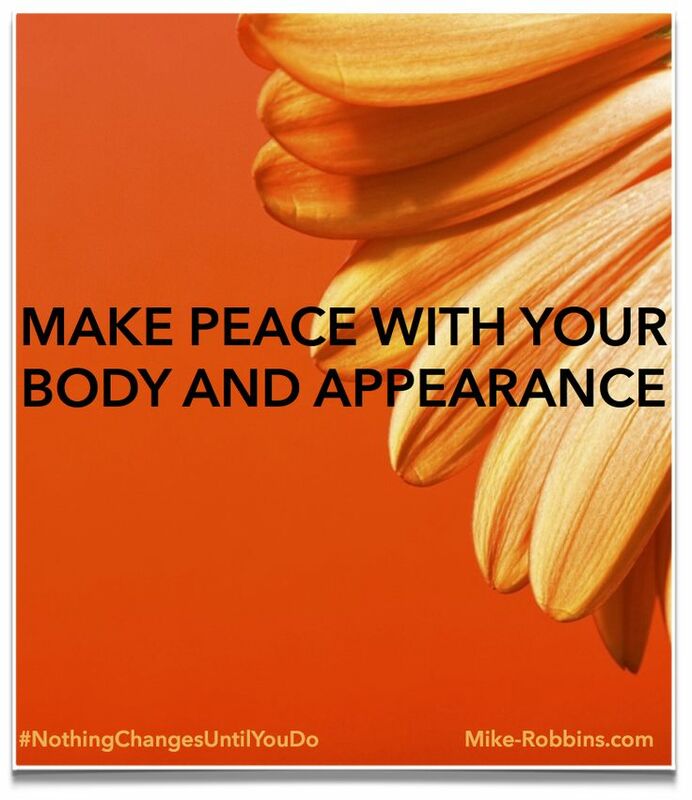 Most people I know have complaints about their bodies and how they look--whether they admit to them or not. There's nothing wrong with us wanting to look our best, take care of ourselves, and be fit. However, billions of dollars are spent each year by advertisers telling us we don't look good enough and need improvement. In return, we spend billions of our own dollars collectively on various products that are supposed to reverse our aging process, regrow our hair, smooth out our wrinkles, whiten our teeth, help us lose weight, make us look and feel better, and so much more. All in all, it sets up an unhealthy dynamic that is based on fear and scarcity. We buy into the idea that we have to do anything and everything we can to keep up, fight the natural aging process, and stay young, fit, and beautiful for as long as humanly possible. It can be exhausting and scary. Over the past few years, I've started to get more real about my own struggles with my appearance and my deeper feelings about my body. Thanks to some great support, inner work, and healing, I've made good progress in this arena--although it still ebbs and flows for me and there is more work to be done. I had what felt like a pretty big breakthrough in 2012 when I decided I was finally ready, after a number of years of avoidance, to update the photos and videos on my website. My last photo shoot, which was in 2008, had been so upsetting and traumatic that I hadn't been interested in doing it again. But by 2012 the images and videos on my website were dated and it was becoming problematic. My hair started thinning when I was in my late 20s. For someone who was already hypercritical of his appearance, this was a scary and painful development. In addition to my own body issues, hair loss had been a big thing in my family, as my father had lost his hair quite young and it caused him a great deal of pain and suffering. So in both my family and our culture at large, hair loss for men is seen as a very bad thing. Even though it's quite common, it's something people (especially other men) often comment on and make fun of. Losing your hair isn't really something you can hide or cover up all that well--it's out there for the whole world to see. By my early to mid-30s, it was becoming pretty obvious, and it was a source of deep pain, shame, and embarrassment for me. Most of the reason I hadn't gotten new photos taken had to do with my hair and my lack of acceptance about it. Although I'd been consistently shaving my head since mid-2011, something about getting these new photos and videos done made me feel vulnerable and scared in a way I wasn't sure I could handle. I reached out to some of the people closest to me to ask for their support, and I found some good professionals to help with the photos and videos. Although I was pretty freaked out, I scheduled a photo shoot and also planned to take a look at some video footage of some speeches I'd recently given. The process of getting the photos taken and the videos filmed wasn't the hard part for me; it was looking at them afterward. Going into both the photo shoot and the speeches I knew were being filmed, I focused my attention on how I wanted to feel, not on how I wanted to look. I also did whatever I could to be kind and loving to myself, even though I was feeling self-conscious. I had Michelle and also Melanie, who works with me, look at the photos before I did--so they could send me the ones they liked best (and hopefully get rid of some of the bad ones). That helped and I was actually quite pleasantly surprised by how they turned out. The videos, on the other hand, were more difficult, as I had to watch myself speaking for hours on end in order to pull out the clips for my speaking demo video and for various pages within my website. My gremlin had a field day with me at first, but after talking to my counselor Eleanor about it, she suggested that I focus on how I wanted to feel while I was watching the videos, which helped shift my perspective and made the viewing/editing process a little easier. Although it wasn't my favorite thing in the world, the whole process ended up being a lot less painful than I expected and the net result was that I was able to launch a new website with updated photos and videos of myself, that fall--which was a huge deal for me on many levels. As I contemplate future photo and video shoots, I still feel a bit scared and daunted. However, these feelings are less intense based not only on this past experience, but also on my personal commitment to making peace with my body and appearance. When I come from that place of peace, things are much different and more enjoyable than when I come from a place of criticism and judgment (i.e., the world of my gremlin). What if we could befriend our bodies and not treat them like enemies we're trying to beat, conquer, or at least keep at bay? What if we could remember how accepting and celebratory we were about our bodies as young children? The key to all of this is not about losing more weight, finding the right workout program, getting the best products, or buying better clothes. It's really about us making peace with our bodies, and, on a deeper level, making peace with ourselves. It's essential for us to forgive ourselves and to also forgive our bodies. In many cases, we have done, said, and thought really negative and damaging things to and about our bodies over the years. With a sense of healthy remorse and a deep sense of empathy, we can begin to forgive ourselves for how we've treated ourselves in the past. At the same time, we can practice forgiving our bodies for not being "perfect," which no body ever is or will be.